In our club, we've had 5 or 6 of these go down in the past 6-9 months or so. Based on their coincidence with battery holder problems, I've long suspected it was a corrupted eeprom causing the failure. The other day, I mapped out the necessary pins, made an adapter, and copied the eeprom from a working ktss-701 module to a locked up one. 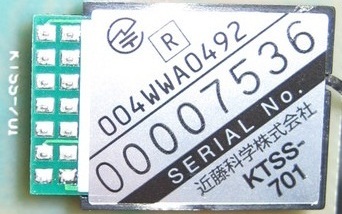 The ktss-701 is the brain/rf module used inside the KT-18. The unit started up fine after that. I did a down trim on power up reset and bound to a dnano and all seems fine now. My guess is that when it gets corrupted, it fails a checksum test and aborts booting. We will flash 5 or 6 transmitters between this Friday and Sunday and run them all together to verify. I am not sure if the Cypress rf chip parameters are stored in the eeprom that might cause interference issues, although reading the eeprom after subsequent resets changed blocks of it which may be rf related and solve that problem. The only thing I expect should change would be wheel and trigger center points. I haven't mapped out most of the eeprom area, primarily because I don't care about that if it works OK.
After the weekend I'll post details, procedure, required equipment, etc. if all goes well. I wonder how widespread this problem is as I've not read much about it as expected considering how many I have personally seen fail. Last edited by I-Lap; 2012.02.08 at 12:26 PM. First, for this you will need a MicroChip "PicKit 2" Programmer and to make an adapter cable. The programmer end is standard .1" header pins, the module end is a 7 x 2 header with 2mm spacing. Here is the connection diagram and a picture of the one I made. The hot glue is for reinforcement and the extra black plastic on the right end is just to physically prevent plugging it in backwards. Install the PicKit 2 software and connect the programmer to USB. Then launch the PicKit software. 1. Check the "VDD ON" box and set the voltage to 3.0 as pictured. 5. Edit the eeprom data window to match the following image. Note that it is all "FF" except for the lines labeled 20 and 60. The two "77"s highlighted blue is where the ID for your module will go. This is the hex representation of the serial number on the module label. The easiest way to get this is open calculator, select View/Programmer, then type your number without the leading zeros, then click the "Hex" on the left to display it as it should be entered. 6. At this point if you want to save the good baseline to a file, click File/Export Hex. This way it can be imported next time. "Programming Successful", disconnect the module and reinstall it in the radio and reassemble. I also recommend giving the two battery springs a little stretch while it is apart and if you have an extra washer, it goes on the little antenna pivot pin. 9. Hold the down throttle trim and turn it on. As soon as it chirps, release the down trim. If held too long, it will then beep, reversing the throttle. If this happens, repeat and let go as soon as it chirps. Sounds like good info. I would expect the eeprom to contain the transmitters unique ID. If it does you may be able to find the unique ID for each one and save just that portion of the eeprom while overwriting the rest. The unique ID is actually in the wireless chip and is used as part of the transmission protocol. My concern is that other parameters such as SOP, PN and CRC codes might be in the eeprom. I'm not worrying too much about this right now, I'm waiting to see if there are in fact any performance problems with 5 or 6 units with the same eeprom. If there is, I'll deal with it then. If not, I won't be delving any deeper. can you help me out with the following terms? Eeprom is a special memory area in the microprocessor where settings for trims, End Points, and other settings are stored that won't get lost when the unit is powered down. From Wikipedia: "Electrically Erasable Programmable Read-Only Memory and is a type of non-volatile memory used in computers and other electronic devices to store small amounts of data that must be saved when power is removed, e.g., calibration tables or device configuration." The down trim power on reset is done to restore all settings to factory default. It also appears to calibrate the potentiometers for the steering and trigger, in that it fixes the left turn at full right command problem. I am pretty sure it is in the KT-18 manual. A checksum test is basically running a formula on a bank of memory and comparing the result with a known good answer to verify it is not corrupted. My theory in this case is that it is failing verification of the eeprom on the bad units and then it just gives up. Booting is what happens when you turn it on. Although it appears almost instantaneous, there is actually a lot going on in that short time as the unit prepares for operation. It is similar to what happens when turn your computer on. Flashing is the procedure that programs the memory, in this case eeprom, into the chip. The SOP, PN, and CRC codes are some of the Cypress rf chip parameters that configure the wireless transmission. Those three allow multiple cars to run on the same channels, but these details are outside the scope of this project. I brought it up because it is the reason I want to test further before proceeding. The above are very basic definitions as they pertain to my original post. Good news, this is all working now. Steve, looks like you were correct about the unique ID being in the eeprom. Most implementations with this chip use the built in ID. Our first test cloned the modules and two controllers drove one car. After a little more digging, I found the ID in the eeprom. It matches the serial number on the module. I mapped out a good portion of the eeprom area, like trims, EPAs, etc. There also isn't a checksum as I originally suspected, so we can edit IDs easily. Next test was to copy a good eeprom to four dead units, and changing the ID to match the original. We ran a few races and they all worked perfectly with no interference or glitching. We also had two units that started up normally, but would not bind, which are also now cured. Looking at the dead module eeproms, I can actually see the corrupted values from incomplete writes. One module that was working had a corrupted ID but still worked, which may explain those mysterious "unbinds". I will post all the details and procedures in the second post of this thread in a few days once I have time to make up some diagrams, take pictures, etc. I still wonder how widespread this problem is and if there is really any interest in this. I still wonder how widespread this problem is and if there is really any interest in this. . Given I had 2 of 3 KT-18s die on me, and I know other have too, I'd guess there would be lots of interest in a way to fix these transmitters. Can't say I understand everything you've written in this thread, but if you can post an easy fix, I'm sure some will be very thankful! Fascinating data and thank you for your investigation, I-Lap. I am very new so I have not yet encountered any problem with KT-18 yet, but I look forward to your detailed post in case I need to rig something up to flash my own in the future. I wonder how those writes would get corrupted... ejecting the battery tray (or even giving it a hard enough shake) at just the wrong time while pressing a trim button? It's also curious why a down trim on power-on wouldn't fix that unless the boot ROM or whatever routine it runs to do the reset is also corrupted. Hey I-Lap, I know of one KT-18 that needs this fix. So if you could tell me more about this it would really help. I also have a couple that need fixing. So any help is welcome. i think you'l find many will thank you once they can repair their transmitters vs. seeing a qnty of posts about them going bad. i've not had good luck with kt-18's myself but i don't use them. i sell off or give away any i come across. do you have to dismantle the KTSS-701 module, or just connecting the visible pins provides access to the eeprom ?